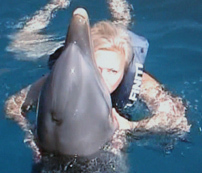 Have you ever dreamed of swimming with dolphins? As scuba divers we have swum with sharks, turtles, and manta rays around the world, yet we have always wanted to swim with dolphins. 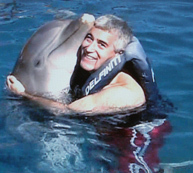 The Adventure Kids finally realized a dream at Delfiniti in Ixtapa-Zihuatanejo, Mexico. Like most kids growing up watching movies about dolphins, we have always wondered about what it would be like to have an encounter with these extremely intelligent mammals. Watching them swim in the wakes of our various boats we knew that they were playful, intelligent, and curious, and we longed for the opportunity to finally meet them one-to-one in the water. 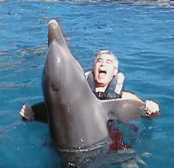 In early December 2007, we traveled to Ixtapa-Zihuatanejo for a warm weather holiday, and were delighted to learn about Delfiniti where we could finally realize our dream of swimming with dolphins. Delfiniti offers several options for visitors from sitting on the elevated platform and observing the dolphins; actually getting in the water for a dolphin encounter and the opportunity to interact with them, shake their pectoral fins, and pose for a kiss; or their most extensive learning program, where you swim with the dolphins, hug and kiss them, and even take a ride with them for a most memorable experience. Since we had waited for what seemed like a lifetime for this experience, we opted for the full package of Swimming with Dolphins. 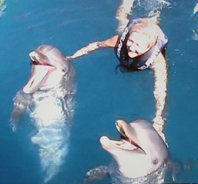 After changing into our swimsuits, donning life jackets, and receiving an introduction to the Delfiniti program, we entered the large saltwater pool under the guidance of a trainer, and with a mix of exhilaration and perhaps a little anxiousness as we waited to meet our dolphins. The trainer told us that there are a total of 11 dolphins consisting of Chocho, Chame, Chato, Lluvia, Brisa, Kaly, Mia, Nena, Chico, Viento, and Habana (5 males and 6 females) at Delfiniti, 7 are Mexican bottlenose nose dolphins from the Pacific coast, and 4 are from Cuba. The two newest of the Mexican bottlenose dolphins are Mia, age 4, born at the facility, and Chato, rescued in 2005, and at age 16, is the oldest of the dolphins. Lluvia is the largest dolphin at 9 feet in length (2.7 meters) and weighing in at over 700 pounds (318 kg). Finally the moment that we were waiting for, our dolphins Nena, a female age 5 years, and Viento, a male age 6 years, entered the pool and swam by us. At first they gave us a wide berth swimming at some distance from us, and then gradually, each time that they approached us, they swam a little closer and allowed us to reach out and gently stroke their sleek bodies. What an incredible thrill to be in the water with these gentle creatures that have an average length of 8 feet (2.4 meters) and an average weight of 200 pounds (91 kg), and actually touch them! As we gained confidence with one another they swam closer to us and each time lingered longer for a caress of our hands. Next on the program was learning to shake "hands" or actually shake their pectoral fins, also called flippers, with Nena and Viento. The dolphins swam to us as we held out our hands and we clasped hand-to-flipper and connected for a shake and a little water ballet, which was another high of our day! After each behavior, the trainers would reward Nena and Viento with treats of calamari, which they swallowed whole and head first, as despite their numerous teeth, they do not chew their food. By this time, we were now fully acquainted with Nena and Viento, and it was time for a more personal encounter, a hug and a kiss. 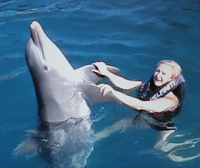 Holding our arms wide open, the dolphins swam into our arms for an embrace as we planted kisses on their adorable faces. 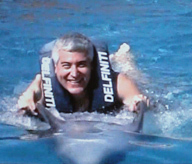 Can you imagine the thrill of being one with a dolphin and actually taking a ride with it? When the trainer told us that we would take a ride with a dolphin by holding onto its pectoral fins and riding on its belly while flying full speed ahead, you can only imagine the level of adrenalin racing throughout our bodies. 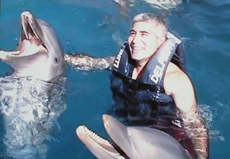 We positioned ourselves on the dolphin's belly, grasped its pectoral fins, and away we flew across the pool. Unable to resist, we shouted out as pure joy raced throughout every inch of our bodies, as we had the ultimate ride of our lives! 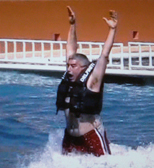 Elated and exhilarated, and just when we thought the day could not get any better, the trainer instructed us to swim to the other side of the pool where we would meet 2 larger dolphins who would push us by our feet across the pool. Keeping our legs stiff and feet positioned, we arched our backs slightly as we waited for our dolphins to approach. 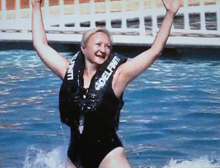 Gradually we felt them push against the bottom of our feet and then suddenly we were rising up and out of the water and actually standing up like a couple of aquatic stars, and feeling the part, actually waved to the audience as we flew across the pool at top speed! As we sat on the edge of the platform, the dolphins swam by us waving their pectoral fins, before leaping high in the air in a final farewell. What an incredibly amazing experience! Luxury Experience Magazine would like to thank Delfiniti for realizing our dream of swimming with dolphins, and for our newfound dolphin knowledge; it is a memory that will last a lifetime. 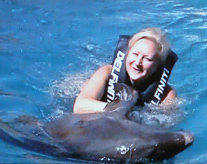 Delfiniti offers programs for all ages including Delfiniti Kids for children ages 3-7 years, Baby Dolphin for infants to 3 years old, and has disabled access. 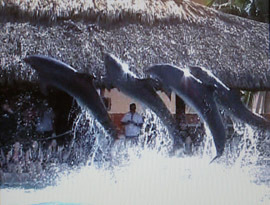 Delfiniti de Mexico S.A. DE C.V. Please read other articles on Ixtapa-Zihuatanejo in the Destinations, Hotels and Resorts, Chefs' Recipes, Music Scene, and Adventures sections.